4. Submit your tax return to HMRC. So here is a quick guide to help make the process as painless as possible. 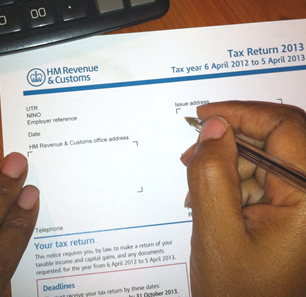 In order to submit a self assessment return you will need a Unique Taxpayer Reference (UTR). This is a 10 digit number that identifies you to HMRC and you will not be able to file a tax return without one. To get a UTR you will have to register for self assessment. You can register over the phone via the newly self employed helpline on 08459 154515. Or else you can register online. If you are a new sole trader who has never registered before you can do so here. If you have started a partnership then the partnership as well as the individual partners must register for self assessment. The partnership must be registered by the nominated partner and this can be done here. The remaining partners can register themselves here. There are other circumstances in which you may have to register for self assessment but they will not be discussed here. Ideally you should have registered with HMRC by 5 October 2013 so if you haven’t yet done so then you need to get your skates on and do so as soon as possible. If you intend to file your tax return online you will need a Government Gateway account. New sole traders and partnerships can register for self assessment and get an account at the same time by using the links above. If you registered for self assessment over the phone then you’ll have to sign up for an online account here. As part of the registration process HMRC will provide you with a 12 digit user ID that you will use to access their online portal. You should make a note or a screen print of your user ID straight away as once you click away from that page you won’t be able to access it again. You will also have to choose your own login password which should be kept safe together with your user ID. HMRC will also send you an activation PIN in the post within 7 days of registration. Once you get it log on to HMRC’s site with the user ID and password that you’ve just created and then activate your account using the PIN that HMRC have just sent you. Once you’ve done all of this you’ll have everything you need to submit your tax return so now you actually need to prepare it ready for submission. As a rule of thumb any money you’ve received from pretty much any source needs to go on your tax return. Of course there are exceptions such as winning the lottery but other than that, chances are that it needs to be reported. The most common entries will include salary or wages from a job, profits from self employment, bank interest from a savings account and dividends from any shares that you own. If you have a job and receive a salary your employer should have given you a P60. The figures that you need from your P60 are your salary and tax for the year. These figures are normally marked with an asterisk so you should easily be able to pick them out. Tip: If you have lost your P60 you may still be able to get these figures from your March payslip or your last payslip before 6 April if you are paid weekly/fortnightly. Your employer may also have given you a P11D if you receive employment benefits such as medical insurance or a company car. In order to make your tax return easier to complete the box numberings on the P11D are the same as on the employment page of the tax return. If you have a bank account that pays you interest then your bank should send you a certificate that tells you how much interest you received for the tax year and how much tax was taken off it. Don’t include any interest you receive in an ISA as the whole point of ISAs is that they are tax free. If you receive dividends from shares then you’ll need to collect all the dividend vouchers that you would have been set each time a dividend was paid. In respect of your income from self employment you need to have kept records of your business income and expenses and ideally you will have prepared accounts. It’s these that you’ll use to report your profits (or losses) and claim any capital allowances. Now here’s a really useful tip: for next year get yourself a large brown envelope and label it “Tax Return Stuff” and as soon as you get all of the various pieces of information, i.e. dividend vouchers, P60, interest statements etc. put them in the envelope. This will save you scrabbling around in January searching for the dividend voucher for the £6.42 that you received from British Gas earlier in the year. Now that you’ve gone through the process of preparing your return it doesn’t end there, you still have to submit the thing. If you want to submit a paper return you need to do so by 31 October so you’d better hurry up! If you do submit a paper return HMRC will work out how much tax you owe and then it’s for you to pay it before 31 January. You are strongly advised to get proof of posting if you send your tax return through the post. You can also file your tax return on line and this method has a ton of advantages over a paper submission. You can either use HMRC’s free tax return software that you can access from their site now that you have your UTR and Government gateway login or you can use third party software. The most obvious advantage of online filing is that you get an extra three months to file. Secondly, most software will check the return as you complete and so should catch any errors. Thirdly the software will calculate your liability for you so that you instantly know how much tax you owe. Finally – do not leave filing your tax return till the last minute. HMRC’s website has been known to crash on 31 January due to the large number of returns being filed that day. Your return must be filed by midnight on 31 January and if you’re late there’s an automatic £100 fine – even if you don’t owe any tax! Finally finally - don’t forget to pay the tax. Any tax you owe must also be paid by the 31 January deadline and interest will be charged on any tax that is late. So there you have it. As HMRC keep telling us “Tax doesn’t have to be taxing” but you need prepare in good time and be methodical about it. Of course if you really can’t be doing with all that palaver then give Joy & Co a call and we’ll gladly take it off your hands. © Copyright Joy & Co. All rights reserved.